The North Myrtle Beach City Council will meet February 25-26 at Santee Cooper's Wampee Plantation Conference Center in Pinopolis, SC to discuss the City's proposed FY 2020 Budget. The meeting includes an executive session. The meeting is open to the public. 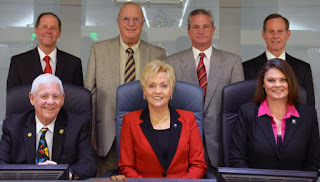 Access the formal meeting and executive session agenda at http://tinyurl.com/yxg3h47z or visit www.nmb.us and look under "Agendas" or "Press Releases." City Council will formally open its two-day budget retreat meeting on February 25 at 8:00 a.m. at City Hall and will then immediately travel to Pinopolis, SC to continue the meeting and discuss the City’s proposed budget. 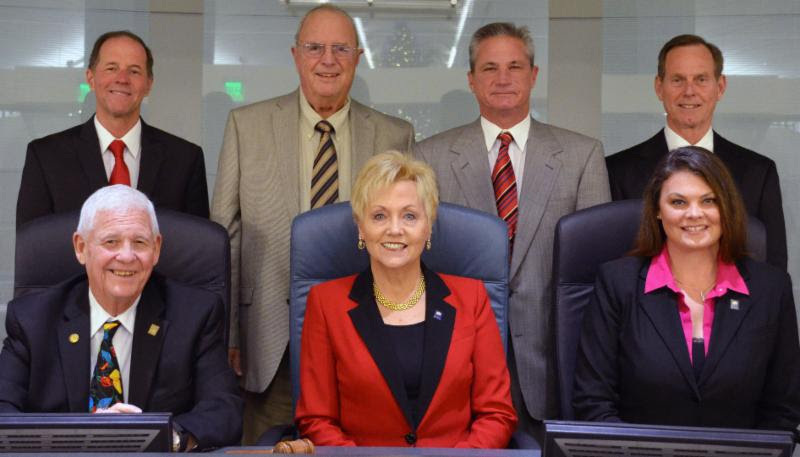 The meeting will end after City Council has completed its budget discussions on February 26. The City’s fiscal year is July 1-June 30. First reading of the proposed fiscal year budget ordinance usually occurs in May. -- The proposed budget involves 17 separate funds with significant interrelations and transfers between the various funds. -- The proposed FY 2020 budget is $91.6 million, about $4.6 million less that the FY 2019 Budget. -- The budget proposes a property tax reduction of about 7.3 mills, reducing the millage rate from its current 43.3 mills to 36 mills. The proposed millage reduction includes the 6.1 mills levied eight years ago to pay off the $15 million bond issue for the purchase of land for and construction of the North Myrtle Beach Park & Sports Complex. The bond is paid. -- As proposed, General Obligation Debt would be $0 for FY 2020. -- Under the proposed budget, the year-end balance for the General Fund would be about $12.5 million, which is above the 35% fund balance policy. -- Equipment replacement would continue on a pay-as-you-go basis. -- The City does not propose rate increases in its Water & Sewer Fund, except for any pass-through rate change from Grand Strand Water & Sewer Authority. -- Discussion of significant water, sewer and road projects will occur at the budget retreat. -- The budget proposes construction of the 18thAvenue North Ocean Outfall beginning in fall 2021. This would enable the City to accomplish the estimated $12 million project without borrowing funds. In the meantime, smaller storm water drainage projects are included in the proposed budget. -- City Council will review about $3.9 million in proposed accommodations tax revenue expenditures. An Accommodations Tax Committee recommends to City Council expenditures of accommodations tax revenue. City Council may approve committee recommendations or redirect funding. 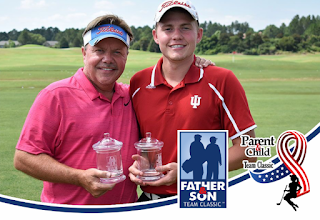 Play the National Father & Son Team Classic - Part of Family Golf Week! 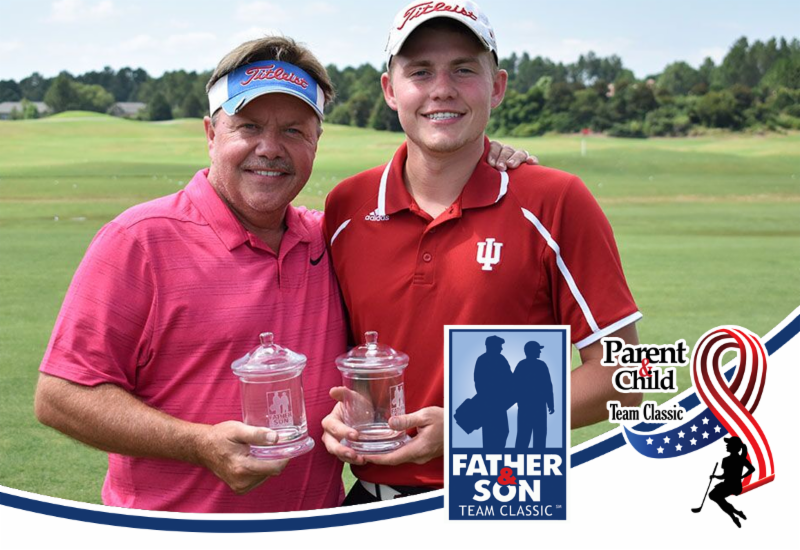 The Father & Son Team Classic is a two-person team, 54-hole event that takes place in Myrtle Beach, South Carolina every July. The event is not just for Father’s and Son’s, but rather for all relationships so long as there is a generational gap. To see who can play in this great event, click HERE. The Parent-Child Team Classic is similar to the Father & Son Team Classic but incorporates all other relationships, such as mother and daughter or mother and son. You can also check out all the relationships that are allowed by clicking HERE. 7AM – 7PM – Check-in at Legends Resort Clubhouse; receive your welcome gift bag! 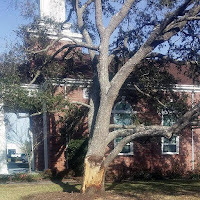 The North Myrtle Beach Tree City Board has selected an oak tree located at Trinity United Methodist Church, 706 14th Avenue South, as its Tree of the Month for February. Those familiar with the tree’s history say it was planted in 1976 in memory of Jim Taibi, who passed away on June 2, 1976. Pastor Reverend William Williams, now a Methodist Bishop, presided over the ceremony and North Myrtle Beach gardener Jane McDaniel supervised the planting. A hurricane severely damaged one of the tree’s large limbs and a portion of its trunk. 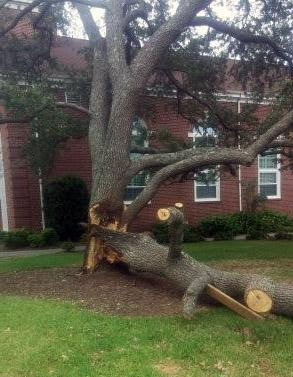 Instead of taking the tree down, the church hired an arborist who restored the tree because of its importance to the congregation and the community. As a result, Sunday school classes can continue a tradition of meeting under its branches well into the future. 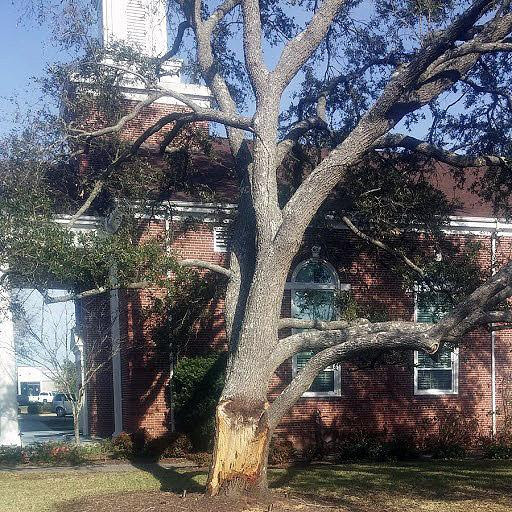 Property owners and developers interested in finding out how they can preserve trees on their property may contact the North Myrtle Beach Tree City Board atnmbtreeboard@nmb.us. The Tree of the Month program began in 2010 as a way to recognize preserved trees in the city. It also provides a platform to remind people of the benefits and importance that trees offer in our everyday lives. If you have a tree you would like to be considered for Tree of the Month, contact Parks & Grounds Superintendent Jim Grainger at (843) 280-5571 or via email atnmbtreeboard@nmb.us. The North Myrtle Beach City Council will hold a Special Called Meeting on Wednesday, February 20, 2:00 p.m. at City Hall for the purpose of entering into an Executive Session for a Legal Briefing regarding the City of North Myrtle Beach, SC vs. SLF IV/Sandridge Development LLC, et al - Case#2017CP2605918. The Cherry Grove Park & Boat Ramp at 53rd Avenue North, including the kayak ramp, will be closed due to construction February 18-March 29. The deteriorating fishing pier located there will be demolished and rebuilt. As an alternative, consider using the boat ramp landing at 2nd Avenue South. 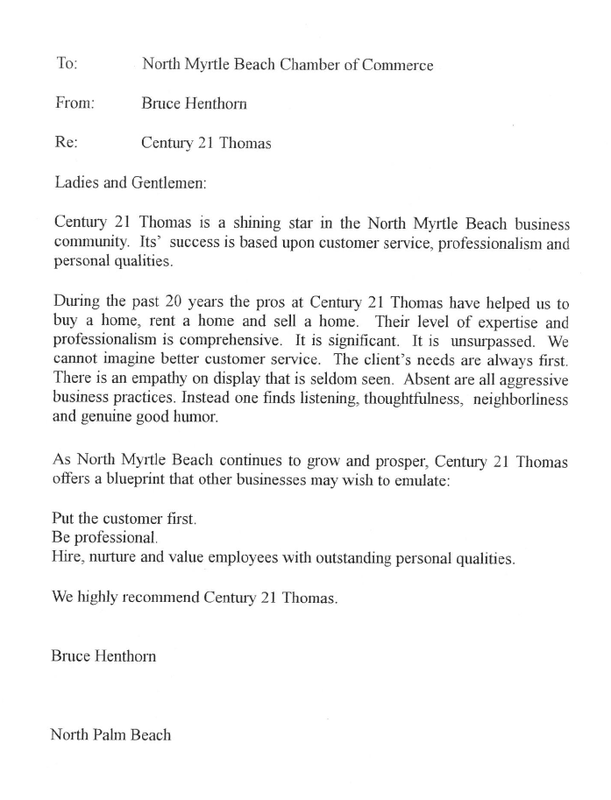 It is so wonderful to receive such amazing letters from your beloved clients! It is the reason we are in business and it warms up our hearts, pushing us to keep working hard with and for our extraordinary customers! 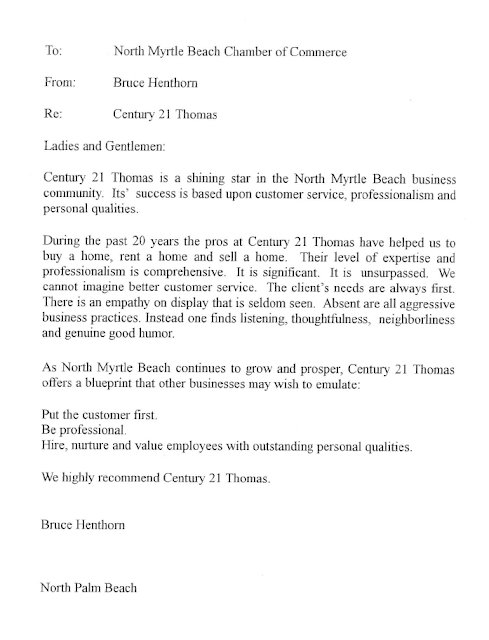 Thank you Bruce, and Thank you to each and every person out there who entrusted us with their business! We are forever grateful! Please join Thomas Real Estate, Inc. on Friday, Feb. 22, from 10 a.m.-3 p.m. at a community Blood Drive. The event will be held at Thomas Real Estate, Inc., 625 Sea Mountain Highway in the Cherry Grove section of North Myrtle Beach. 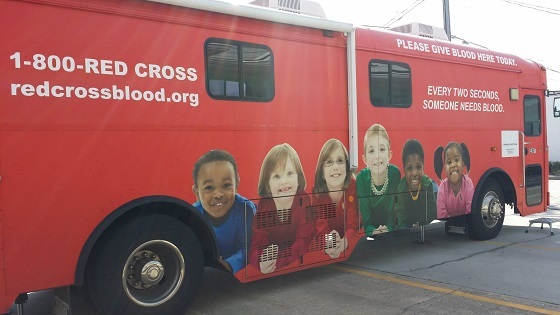 Please schedule your appointment in advance by going to www.redcrossblood.org (sponsor code: CENTURY21). Let’s continue to build North Myrtle Beach and save lives as we support the American Red Cross! The City has published its FY 2018 Annual Report. It is a summary of City projects and accomplishments as they occurred during FY 2018. The format works best on a computer or tablet screen. The City's Finance Department offers a Comprehensive Annual Financial Report(CAFR). 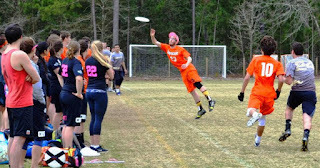 All CAFRs from 2007 through 2018 can be accessed via this link:http://www.nmb.us/Page.aspx?id=24. City Budgets from 2008 through 2019 can also be accessed through the same Finance Department link. Enjoy Sports And Helping People? Volunteer for the North Myrtle Beach Sports Tourism Ambassador Program! 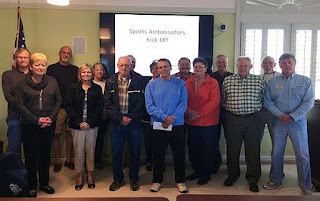 If you enjoy sports and helping people, you may enjoy being a volunteer North Myrtle Beach Sports Tourism Ambassador. 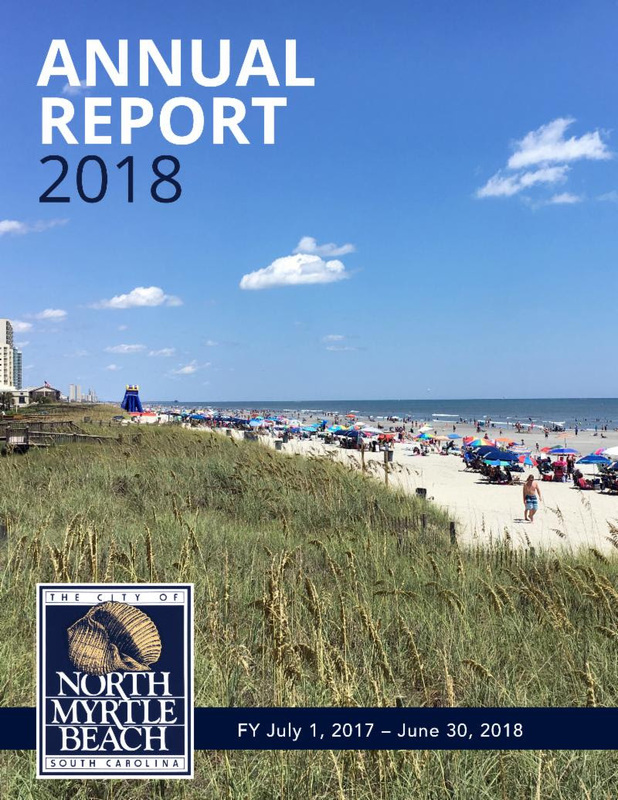 In partnership with the North Myrtle Beach Chamber of Commerce, the North Myrtle Beach Parks & Recreation Department created the North Myrtle Beach Sports Tourism Ambassador program. Our Sports Tourism Ambassadors, dressed in blue polo shirts, are easily accessible and always eager to answer questions and interact with spectators at North Myrtle Beach sports events. They also provide support for sports tournament directors and at community events. Many of the families who accompany sports tournament participants to our city stay two or more days in the community and are always looking for things to see and do between games. Sports Tourism Ambassadors help ensure these visitors experience the full range of North Myrtle Beach hospitality. To learn more about becoming a volunteer Sports Tourism Ambassador, please contact Athletic & Sports Tourism Director Amanda Player Wofford at agplayer@nmb.us or call 843-281-3802. Mayor Pro Tempore Terry White presided over the meeting while Mayor Marilyn Hatley was on City business in Columbia, SC. During the meeting, Council approved a special event permit for the March 16 St. Patrick’s Day Parade, beginning at 9:00 a.m. on Main Street. Council approved a special event permit for the March 16 St. Patrick’s Day Festival, 11:00 a.m. to 4:00 p.m. on Main Street. The festival includes about 150 vendors, 3 stages offering live music, and a children’s area offering rides and amusements. Council passed second (final) reading of an ordinance amending the Town Centre area in the Barefoot Resort Planned Development District. The amendment revised the portion of the Town Centre area of the Barefoot Resort Planned Development District on vacant land alongside the Intracoastal Waterway and marina. Barefoot Cottage Village is destined for the site. It is a residential neighborhood described by its developers as “reminiscent of the simple life of small town America” and offers 274 in-common cottage units ranging in size from 510 square feet to 1,292 square feet. Changes required by City Council prior to passage of second reading included the developer’s agreement that no rentals of units within the project may be for a term less than 30 days, and the developer will pay a $1,100 per unit beach parking fee at the time of building permit application. The per-unit parking fee goes into a fund to support improved and new public parking opportunities. 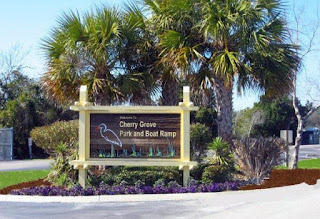 Council passed second reading of an ordinance to amend the Beach Cove Ocean Resort Planned Development District (PDD) changing the monument sign located on South Ocean Boulevard at 48th Avenue South. The changes include adding an LED display screen to the sign. The screen will display information about resort events, amber alerts, and local weather. Screen brightness will vary to meet day and night viewing requirements. Council passed first reading of a proposed ordinance to rezone one lot of about 1.96 acres located off Commons Boulevard behind California Dreaming from HC (Highway Commercial) to R-2A (Midrise Multifamily Residential). Access to Commons Boulevard would be further scrutinized at the subdivision or site plan level of City review. Council passed first reading of a proposed ordinance to amend several sections within Chapter 3 of the City’s Code of Ordinances entitled, “Alcoholic Beverages”, to allow for the establishment of a festival zone, which would allow beer and wine to be consumed in approved areas of shopping and/or entertainment destinations of 10 or more acres. If the proposed amendment passes final reading before City Council, a property owner could apply to the City for a permit to have a festival zone within their location. The application process would require the property owner to submit a map depicting the exact boundaries of the desired festival zone, a detailed narrative of how the property owner would manage the possession and consumption of beer and wine within the festival zone, and other facts. The property owner would submit the permit application to the City Manager and Director of Public Safety for review and comment and a recommendation to City Council at least 30 days prior to the meeting at which City Council would consider the permit request. If Council approves a permit request for a festival zone, the City Manager would monitor compliance of the approved plan. If the City Manager determines that a permit holder has violated the terms or parameters of an approved festival zone, the City Manager at his sole discretion would have the authority to suspend or revoke a festival zone permit. Council tabled until its March 4 meeting a proposed ordinance to amend the Prince Planned Development District to allow for a Hampton Inn & Suites hotel and parking garage. Placing overhead utilities underground is a requirement of all planned development districts. City staff has recommended that the developer pay a fee in lieu of completing the utilities work in order to align the work with SCDOT’s schedule for placing overhead utilities underground along Ocean Boulevard. Negotiations regarding the fee are underway. 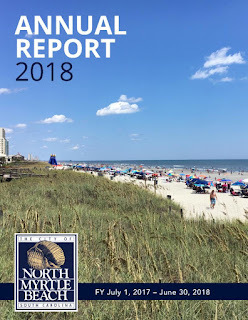 During their February 4 meeting, the members of the North Myrtle Beach City Council adopted a Resolution in support of implementing a long-term strategy to reduce the presence of single-use non-biodegradable plastics in the North Myrtle Beach environment. Council notes that the community is heavily dependent on tourism and to sustain that activity, it is necessary to provide visitors with a high quality, clean, safe, environmentally responsible experience. Single-use non-biodegradable plastics are increasingly coming into focus as a threat to land and sea, and an important source of environmental and habitat damage, in addition to being an eyesore when disposed of improperly. The City is also working on a proposed ordinance pertaining to this issue, scheduled for first reading at the March 4 City Council meeting.